Home → Chemicals → Hillyard, Arsenal One, Suprox Multi-Purpose #38, Dilution Control, HIL0083825, Four 2.5 liter bottles per case, sold as One 2.5 liter bottle. 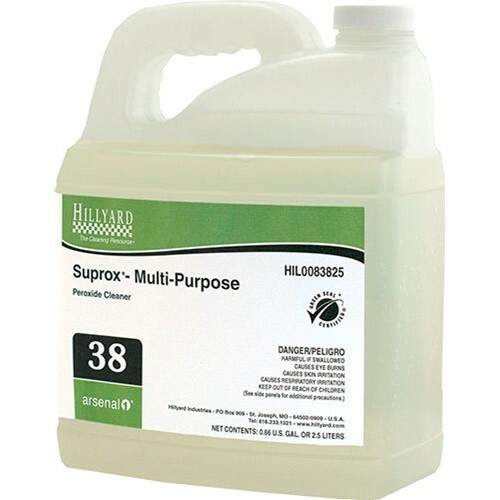 Hillyard, Arsenal One, Suprox Multi-Purpose #38, Dilution Control, HIL0083825, Four 2.5 liter bottles per case, sold as One 2.5 liter bottle. This multi purpose, stabilized hydrogen peroxide and natural citrus solvent cleaner provides highly effective cleaning for surfaces including, restroom fixtures, tile, grout, counters, and more. Can be used for carpet extraction (rinse thoroughly). Always pretest for colorfastness in an inconspicuous area before use. With regular use, it aids in brightening grout and enhancing the appearance of tiled surfaces. Hillyard, Arsenal One, Dilution Control, Portable Dilution Control Kit, Dispenser, HIL99705, sold as each. Hillyard, Arsenal One, Foamer attachment for Arsenal One portable dilution control gun, HIL99707, sold as each.